I'm in a quiet room. My coworkers type away at their keyboards on a slow Saturday morning and then their attention is drawn towards me. They look at me with mix of disdain and bemusement. I was attempting to turn off an Xbox One with a voice command and nothing happened. Those feelings of disdain and bemusement? They're the exact feelings I currently have for the Xbox One China edition. Now here's the deal. Kotaku has already written extensively about the Xbox One. This isn't a review at all. If you want a review, here's the link. Oh, we also did an update for how the system is 6 months after release, here's that link too. This is a look at separate features only found on the Chinese Xbox One that was released on September 29, 2014, the first official video game console to be released in China since a long time ago. For full disclosure, this Xbox was provided to me by Microsoft's China PR team. The Xbox is on loan to me and will be used within the China Daily building, where I work during the day. 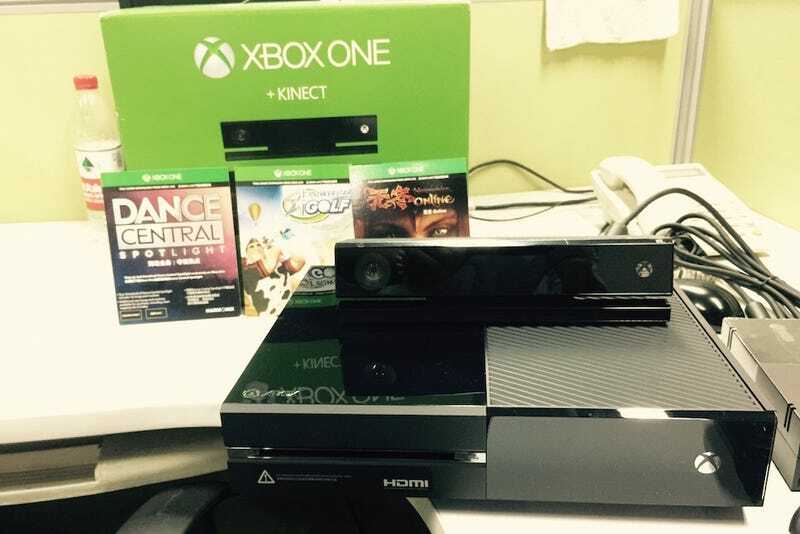 The system we have on hand comes with three free games and a Kinect. It is the $700 model. So what makes the Xbox One China special? Physically it's completely identical to regular Xbox Ones. Turn it on, and it still has the similar Windows 8-esque interface. However, unlike the ones you can get in other countries, this system is set and locked into China, thus forcing the language to be only in Chinese. Straight out of the box is the Xbox, Kinect, a power brick, a HDMI cable and a controller. What's added to the Chinese packaging is localised guides, info booklets, and three cards with QR codes to download games with. These QR codes provide the download for the three free games that come with the Chinese Xbox: Neverwinter Online, Dance Central, and Powerstar Golf. Once the Xbox is set, it's time to turn it on. Upon turning on the system, I was prompted to download and install a 300 mb patch, sign up for a Chinese Xbox Live account, and set up an account for players on the Xbox itself. All in all, total set up took about 45 minutes to an hour. With the Xbox set up, the quest for games begins. Signing on to Xbox Live is incredibly simple and smooth on the Chinese Xbox, things move much faster than they did on the 36o, which never saw an official Chinese release. That said, signing on to Xbox Live with the system lead to a very disheartening view. The Xbox Live store, the location where players can purchase and download games and apps, is bare! Oftentimes games are featured and then show up repeatedly again in other categories. The reason this happens is because the number of games available at launch was 10: Forza Motorsport 5, Kinect Sports Rivals, Powerstar Golf, Zoo Tycoon, Max: The Curse of Brotherhood, Dance Central Spotlight, Neverwinter Online, Rayman Legends, Trials Fusion, and Naughty Kitties. The above mentioned are all that's available on the game side of the Xbox One in China. Moving on towards apps, the number is just as limited. The only one I was able to download was Skype, which, to my understanding, came with the Xbox in the West. Now this next bit is a bit ridiculous. To launch the system in China, Microsoft partnered with Chinese iPTV provider BesTV. The company makes internet TV streaming boxes. Microsoft has also positioned the Xbox in the West an entertainment device with the ability to play Blu-Ray and stream videos. Well... The Xbox One China only has the Blu-Ray. The video streaming service provided by BesTV is currently disabled. The reason? I'm not sure, but according to news around the water cooler (people I can't name due to confidentiality reasons) it's that apparently the Chinese government is stepping back and looking at the Xbox One all over again. So with no video streaming ability whatsoever and ten limited games, it was time to take a look at the games themselves. All the games available on the Xbox One in China have been localised and translated to Chinese. It's kind of interesting to hear Western characters speak in Mandarin, and in weird Chinese Central Television-style accents. Games such as Powerstar Golf and Dance Central are already out in the West and I won't bore you with a detailed account, since there haven't been any changes apart from language. While the Western games were localised, the Chinese games were homegrown products. I can't go into Neverwinter Online too much, I need to play more of it, but what I can say is that unless you're a card carrying citizen of China, you're going to need a PRC identification number. Neverwinter Online requires enrollment into Perfect World's passport program, something similar to Battle.net for Blizzard or Uplay for Ubisoft. Signing up for Perfect World's passport requires the use of a Chinese ID. Naughty Kitties is the first of Microsoft's push into China as motivated by its ID@Xbox program, where independent developers make games for the Xbox. Microsoft sought out loads of development teams in China and promised somewhere along the lines of 70 indie titles available during the launch window. So far only Naughty Kitties has been delivered. Free to play, Naughty Kitties is one of the first "indie" products exclusively made for the Xbox One, and it is a let down. By no means is the game a bad game, it's more of a mobile game than it is a console game. The game, almost set up for failure, has been pounded by Chinese netizens unhappy with receiving a mobile game in lieu of a Halo or Titan Fall. The situation with Naughty Kitties amply sums up the Xbox One China's problems: lofty unmet expectations. The console is in this awkward situation in China, just as awkward as it is to be talking to an unresponsive computer in a quiet office setting. I'm holding off on my judgement on the Xbox One in China. Microsoft promised more games and BesTV's streaming service is going through government regulators as we speak. A console launch window usually lasts till its first Christmas, and I've got my review unit just before. For all we know, the government could let go and the Xbox could be awesome. The Xbox One, in fact all consoles, needs to do well in China. Growth in China means more developers focusing on making games for the market, creating new players. More players means more chances for people to meet and play games together. Enlightened gamers can also change the culture of grey market imports and piracy in China. I want Microsoft to do well in China, just like I want Sony and Nintendo to do well, but I can't help but feel that in its drive and desire to be the first in China, the Xbox One killed all of the historical significance and goodwill it received by putting out an awkwardly situated product. A product like Naughty Kitties, well-made and fun, but not what the people wanted or deserved.